Thursday, January 10, from 5 - 7 p.m.
648 Beacon Street, Boston, MA 02215. *Please note that there will be a presentation at 5:45 by the Institute's president Siri Karm Singh Khalsa. Refreshments will be served. Teaching English is a challenging and rewarding opportunity in itself, and also a means to attaining other goals. For example, it enables those who want more than a superficial tourist's view of a country to find work so they can settle in for a longer stay. If you choose to teach English overseas, you will also benefit on your return from the fact that many companies and graduate schools value international experience. Individuals who have lived overseas are able to offer an international perspective and awareness that is an asset in both the classroom and the professional world. If you choose to teach English in the United States, you can make a difference by teaching English to individuals whose personal, academic or professional lives will be enhanced by the skills acquired in your classes. Whatever your ultimate goals, the self-knowledge and cultural awareness gained by living and working in another part of the world, or with individuals coming from other cultures, will be invaluable. I speak English perfectly well. Why do I need a certificate to get a job? In the past, especially in countries that were cut off from a supply of native speakers of English, any American could simply ask for a job teaching English and be given one. Today, school administrators are more particular about the qualifications of the individuals they hire. Being a native speaker of English does not automatically confer the ability to teach the language. Teaching English is a challenging job that requires not only creativity, patience, and intellectual curiosity, but also an understanding of English grammar and knowledge of language-teaching techniques. A TEFL Certificate shows prospective employers that you possess the professional tools to teach English successfully. Not only will you be a more attractive candidate to employers, but your skills, knowledge and teaching experience will make you more comfortable, confident and effective as a teacher. Earning a TEFL Certificate will also enable those interested in further study to acquire practical experience before investing many thousands of dollars in a graduate program. Many universities will grant graduate credit for the work completed in a TEFL Certificate program. I'm confused by all these terms: ESL, EFL, TEFL, TESL, and TESOL. What do they mean? How are they different? All of these terms refer to teaching English to individuals who are not native speakers of the language. ESL stands for English as a Second Language, and TESL stands for Teaching English as a Second Language. EFL refers to English as a Foreign Language, and TEFL, as you would expect, to Teaching EFL. In general, ESL is used to refer to teaching English in an English-speaking country, and EFL to teaching English in a country whose official language is not English. TESOL, which stands for Teaching English to Speakers of Other Languages, is becoming more commonly used because it encompasses both TEFL and TESL. Most EFL/ESL training programs now use the standard label of "TEFL Certificate Program" for their teacher training courses. What kinds of people enroll in a TEFL Certificate Program? Our program attracts people with varied backgrounds, including college students and recent graduates, career changers, and retired people. The Boston Language Institute's trainees have even given up the practice of law and medicine to go into language teaching. Some want to begin a long career, while others want to live overseas for a period of time, or to volunteer at a community organization. Some have never taught before, while others have some teaching experience but want to qualify for a new area of teaching. For all of these people, a TEFL Certificate program provides the fundamental skills necessary for good language teaching. Is this program suitable for people over 40? Although the majority of our students are in their 20's or 30's, our program has many graduates who took the course in their 40's, 50's and 60's. The personal maturity and life-experience of older trainees serve them well in the program, and enhance their abilities as teachers. In addition, many cultures view older teachers with great respect. Do I need to know the language of my students? No. Most schools today do not encourage the use of students' native languages in class, even when the students are beginners. Further, in many settings students in the same class may have a variety of native languages. Trainees in our program, after participating in a mini-class taught entirely in Zulu, Czech, Japanese, Farsi or another unfamiliar language, learn the techniques and develop the creative skills to teach only in English. We do not require participants in our program to have a college degree. Having one may be helpful, however, in securing a job. Some schools require candidates to have a degree, and some countries, such as Japan, will not issue a work visa to individuals who are not college graduates. Still, there are many opportunities for teachers with TEFL certificates but no college degree, both in the U.S. and overseas. A good ESL/EFL teacher does need a solid general knowledge of a wide variety of topics, but this knowledge may be acquired through life experience and self-study, not just through a college education. Our most important considerations in granting a TEFL Certificate are your efforts and your accomplishments in meeting the requirements of our program. What can I expect of the Program? Will it be difficult? You will take part in methodology classes in which full participation is essential. You will also be expected to teach six ESL classes. You will start out preparing very short lessons to present to your fellow course participants, and work up to teaching full classes of ESL students. Practice teaching is always under the guidance of our experienced teacher trainers, who will offer extensive support and feedback to help you improve your skills. Because the program is intensive, you should plan to set aside time for homework, including reading, lesson planning and preparation of your final project. The process is quite demanding, but when you receive your certificate you will know you have constructed a solid foundation upon which to build your growth as a teacher. While the program is challenging, we do laugh a lot and each group of trainees usually forms a tight bond, both in and out of class. The program will prepare you to teach listening, speaking, reading, writing and grammar while using only English in the classroom. You will also complete modules on lesson planning, error correction, cross-cultural issues, pronunciation, teaching Business English and more. You will have the chance to apply your new skills in your practice teaching sessions with real ESL students. Will I receive assistance in my job search? A special career workshop is part of The Boston Language Institute's TEFL Certificate Program. Topics include job markets, interviewing techniques, resume writing, evaluating a contract, and other skills that will start you off in the right direction. We provide extensive resources to help you locate available jobs, and do research on teaching conditions and opportunities on the countries in which you may wish to teach. You may continue to use these resources, such as our computerized job bank and our alumni network, after you graduate. We will provide you with a letter of attendance when you complete your course requirements, and remain available for references or other one-on-one assistance..
What kinds of jobs can I get? TEFL program graduates find jobs in grade schools, high schools, universities, adult education centers, private language schools and social service organizations. Some people even free-lance, teaching business people in their offices, or meeting for one-on-one conversation classes. The kind of job you get depends partly on the kind you want, the city or country where you would like to work, your previous experience and your performance at job interviews. Keep in mind that as you gain teaching experience, you will have a wider range of opportunities from which to choose, and a better sense of which assignments suit your skills and interests. Where can I get a job? English teachers can find jobs all over the world. Countries that currently have especially great demand for native speakers of English include those in Asia (Korea, Japan, China, Thailand), in Latin America (Brazil, Argentina, Mexico, Chile), in Eastern and Central Europe (Poland, Hungary, Russia), and in the Near/Middle East (Morocco, Kuwait, Saudi Arabia, the United Arab Emirates). It is challenging for holders of American passports to find work in countries belonging to the European Union, but many of our graduates have been successful in finding jobs after they move to the European country where they wish to work. ESL teaching assignments are plentiful in the US. Teachers at language schools generally start out with part-time work, which often leads to a full-time job. 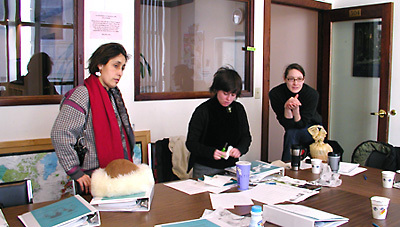 Adult education centers, local governments, religious organizations and social service agencies frequently organize ESL classes. TEFL graduates without state teaching certification can get jobs in private elementary and high schools, and sometimes can find work in public school systems where ESL teachers are in short supply. Finally, some graduates may qualify to teach at community colleges or university-run intensive English programs. How much can I expect to earn? How much you earn overseas will depend on the country in which you work and your level of experience. In some countries, such as Japan, Korea or Kuwait, you will be able to live well, while saving money to bring home. In countries where the economy is weaker and the exchange rate less favorable, such as Mexico or Thailand, you should be able to live comfortably on a teacher's salary, but not save much in dollars. In addition, depending on the country and the contract, you may be provided with health insurance and accommodations. Some teachers even have all or part of their airfare paid by the school that hires them. Remember, too, that if you stay overseas for one year, you may not be liable for US income tax on your salary. In the United States, teaching rates at language schools typically range from $15 to $20 per hour for general teaching, and $22 to $50 for specialized teaching or privately-arranged classes. A full-time teaching load at a language school is typically 25-28 hours per week. Full-time teachers generally receive employee benefits. Pay for teachers in public or private schools will vary according to the location and the individual's teaching experience. -I speak English perfectly well. Why do I need a certificate to get a job? - I'm confused by all these terms: ESL, EFL, TEFL, TESL, and TESOL. What do they mean? How are they different? - What kinds of people enroll in a TEFL Certificate Program? - Is this program suitable for people over 40? - Do I need to know the language of my students? - Do I need a College Degree? - What can I expect of the Program? Will it be difficult? - What topics will be covered? - Will I receive assistance in my job search? - What kinds of jobs can I get? - Where can I get a job? - How much can I expect to earn? Learn the Communicative Approach based on the latest research in language learning. Teach real ESL students under the guidance of expert trainers. Receive life-time, personal support in your career development. Create a portfolio that will make you stand out with potential employers. Become a part of a worldwide network of program alumni, currently teaching in the United States and more than 30 foreign countries. As a graduate, enroll in a free six-week session (4 weeks in summer) in any of our 12 most common foreign languages. Unique money-back guarantee; please call for details. Call us or visit us and discover why Our TEFL Course is one of the best-regarded TEFL programs in the US. Instruction offers students an opportunity to work one-on-one with an instructor at their own pace. The instructor carefully selects materials and plans lessons to effectively meet the student's goals and individual learning style. Private programs offer a flexible schedule and a customized curriculum. A minimum of 24 hours of instruction with one or two classes (each 90 or 120 minutes) per week is the suggested module, but dates, times and content can be arranged according to your requirement. continue from one session to the next with no more than a 2-week break. begin any level in any session. progress more rapidly through 4-week summer Fast-Track programs. benefit from a more efficient and student friendly class schedule. Immersion programs are designed to teach the equivalent of levels 1 to 5 of the Institute's regular core programs in one 6-week or 4-week, 90-hour sessions. Classes meet Monday through Friday, 3 hours a day in 6-week programs/4.5 hours a day in 4-week programs.